One day, the Wheatleys saw Phillis writing on a wall with chalk. Rather than punish her, the Wheatleys encouraged her to learn. Their daughter tutored her in reading and writing. Wheatley also studied English literature, Latin, and the Bible, but what she did best was to write poetry. 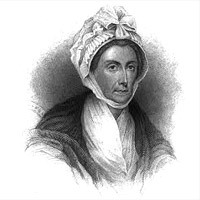 Her first poem was published in the Newport Mercury newspaper in 1767. Six years later, in the service of the Wheatley family, Phillis Wheatley sailed to London where she hoped to meet Selina Hasting, the Countess of Huntingdon. While they were not able to meet in person, the Countess helped Wheatley publish a volume of her poetry in 1773. Wheatley had another surprise waiting for her back in America.